Carlton Drake (Riz Ahmed), founder of Life Foundation, sent a manned rocket to explore other planets in the hopes of finding one humans can inhabit, as they are slowly ruining Earth. What no one outside the company knows is that Drake had the astronauts bring back a few specimens of alien life forms. The specimens, which Drake dubs “symbiotes”, must bond with a host to survive Earth’s atmosphere. Drake hopes the bonding process will also allow humans to survive on the alien planet when the time comes. Eddie Brock (Tom Hardy) is an investigative journalist known for his somewhat unorthodox manner. During an interview with Drake, Eddie goes off-script, pushing for answers about reports the Life Foundation uses unapproved human testing for many of its projects. The fallout of the interview leaves Eddie unemployed and his girlfriend (Michelle Williams) breaks up with him. When Dr. Dora Skirth (Jenny Slate), a scientist at the Life Foundation, realizes Drake’s experiments with the symbiotes is killing its human participants, her conscience gets the better of her. She contacts Eddie and sneaks him into the lab so he can see what is going on and expose what is going on. While in the lab, one of the symbiotes, named Venom, bonds with Eddie. Hunted by Drake’s henchmen, Eddie and Venom work together to save themselves and stop Drake before it is too late. Venom isn’t your typical superhero movie, since it technically isn’t about a superhero, but it sure feels like one. 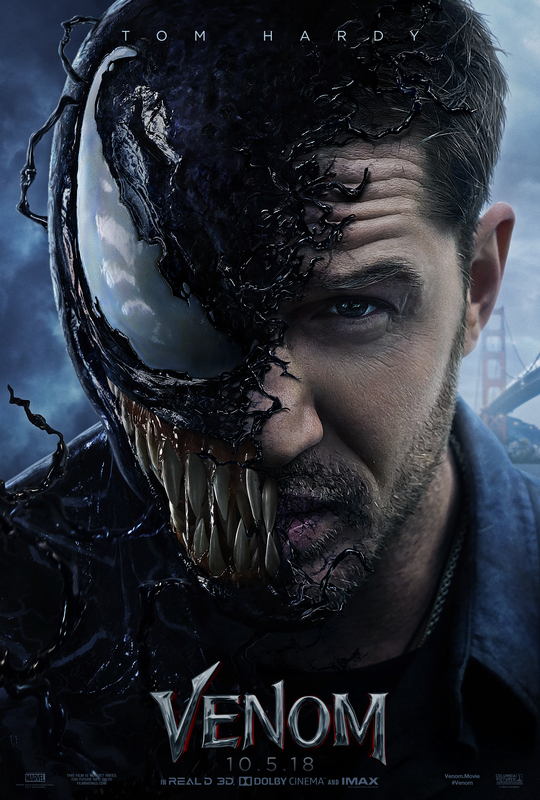 Tom Hardy, as both Eddie Brock and Venom, is the star of the movie. Everyone else in the film is, more or less, just set dressing. The best moments of the film are Brock’s interactions with Venom. The two banter and argue constantly. In a way, it is reminiscent of Deadpool‘s breaking of the fourth wall but, at the same time, it is completely different. It provides some exposition that both explains and moves the plot forward, and it is witty and sarcastic. Hardy plays well off himself, giving the film a nice edge. Eddie’s girlfriend is played by Michelle Williams, which was a bit of a surprising choice. She does fine, but it is a relatively minor role that could have been filled by just about anyone. Riz Ahmed as the “bad guy”, blatantly modeled after Tesla’s Elon Musk, and the rest of the cast are fine, but the movie really only develops and focuses on Hardy’s Eddie/Venom. Fans of the Spider-Man comics will undoubtedly know Venom’s story. I knew a little from Toby Maguire’s Spider-Man 3, and even less from the few comic books I read as a kid. Neither really provided much insight aside from it was Spider-Man in a black suit who acted a little different. Venom dives in deep giving a full explanation of how Venom comes to Earth and becomes a villain/anti-hero. There is plenty of CGI-heavy action, including a car chase that may last just slightly longer than necessary and the final battle scene calls to mind the heavily CGI battle between Hulk and Abomination at the end of Edward Norton’s The Incredible Hulk, but it works well. What makes the movie enjoyable is the relationship between Eddie and Venom. It is slightly neutered by its PG-13 rating, given that, apparently, one of Venom’s favorite things is biting the heads off people. It doesn’t necessarily hurt the film and I don’t think they wanted to make the full jump into Deadpool territory. Venom is a silly, predictable non-superhero movie that is, above everything else, fun. It is a mindless hour and a half you can just sit back and enjoy the ride. Don’t try to overthink it. Hardy does a great job with both the action and the humor. You will definitely want to see it in a theater to catch all the chaotic action. There is a mid-credit scene that you will want to stick around for. There is also a post-credit teaser that is an extended trailer for Spider-Man: Into the Spider-Verse. Feel free to leave after the first one.